A couple of weeks ago, when I was in San Francisco, I visited a dollar-fifty store in Japantown. Where, you guessed it, everything cost $1.50 and was Japanese. Since everything inside was Japanese, their kitchen aisle was full of amazing Japanese cooking and baking tools. I found a pair of cookie cutters (well, technically they were labelled as carrot or daikon cutters) that made 3D animals. I had seen 3D cookie cutters online before, but this was a perfect opportunity to finally try them (and it only cost me a couple of dollar-fifty’s). I picked up a set of elephant and bunny cookie cutters. In each set there were different cutters for the different parts of the animal (e.g. for the elephant there was the main body, the ears, and two separate cutters for the legs). After baking, all I needed to do was to join the cookies at the slots by sliding them into each other. Since I was making animal cookies, I decided to use Stella’s animal cracker recipe. I didn’t think that sugar cookies would cut it. After baking, I had to make some of the slots bigger by cutting them carefully with a paring knife. I also applied a little bit of icing glue (made from icing sugar and water) to help keep the parts together. These cookies are very easy to bake, but assembling them is a pain if the slots are not big enough. I ended up assembling a few elephants, and then just snacked on elephant feet. If you want to make your own 3D cookies, search around on the web for some 3D cookie cutters. Be sure to send me some photos, or better yet some cookies. 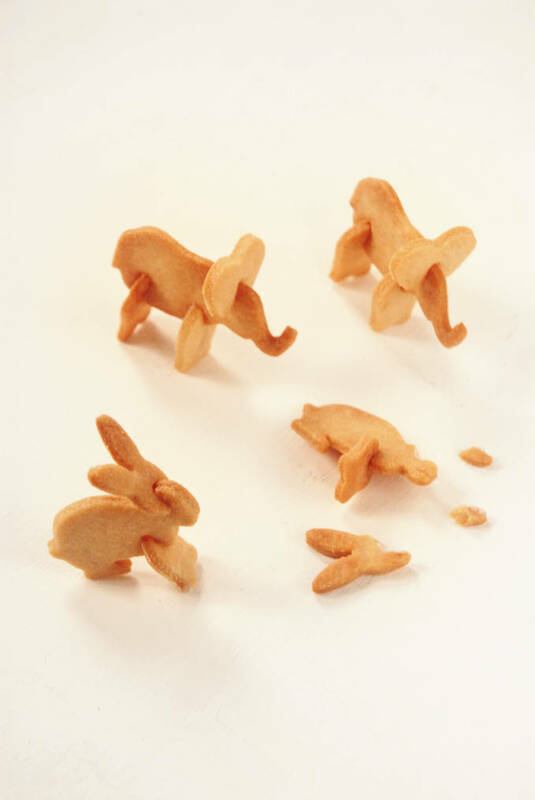 3D animal cookie elephants and bunny rabbits made with special cookie cutters. Recipe slightly adapted from Stella. Cream together the butter and the sugar on medium speed until just combined, and not until "light and fluffy". Add in the nutmeg, salt, and vanilla. Mix until combined. Turn the mixing speed down to low, and add half the flour. Mix just until incorporated. Add half the egg whites, and mix until combined. 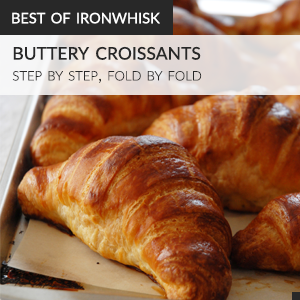 Repeat with the remaining flour and egg whites. Wrap the dough in plastic wrap and chill in the fridge for 1½ hours. Roll out the cookie dough on a lightly floured work surface until the dough is 0.6 cm (1/4 inch) thick. Cut out the cookies using your cookie cutters and gently transfer them to the parchment paper, using the end of a spoon to remove the dough from the cookie cutter. Be careful not to change the shape of the cookie. Preheat the oven to 350°F, and meanwhile place the baking sheets in the fridge. Chill the cookies for at 30 minutes, and then bake for 12-14 minutes, or until lightly browned around the edges. Mix the icing sugar with the water until you get a thick paste. Slide the cookies together, using icing glue if necessary to keep them together. If you are having trouble getting them to fit together, gently cut the slots larger using a paring knife (the cookies are hard, so cut very carefully to prevent them from snapping). omg these are so adorable I could just die. 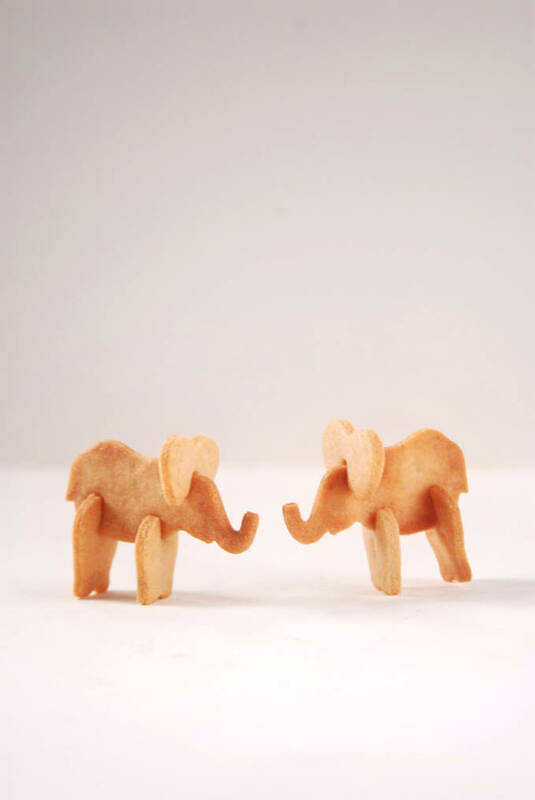 What a fun little post, I love the 3-D animal cookie cutters. I wonder if it might be easier to assemble when the cookies were still slightly warm from the oven? We have some dollar stores in Toronto which I have nick-named “Everything BUT a dollar store” because virtually nothing is a dollar. It’s nice to see that the Japanese store named themselves aptly and priced accordingly for $1.50. I will have to keep my eyes open for these 3-D cookie cutters when I head over to the Ashley Warehouse Sale in November/December — they always have some very exciting kitchen gadgets. PS, I like the bunny cutter the best. These are so awesome!! Cutest thing I’ve seen all week! Haha…this is one of the coolest things I’ve seen! Too funny.